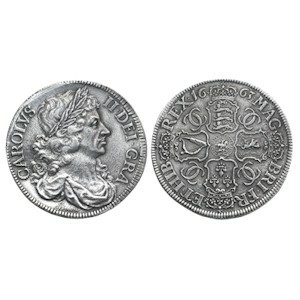 The Charles II 1663 Petition Crown’s, the work of Thomas Simon, are arguably the most spectacular coins in the entire milled series. A Petition Crown set a new world record for English silver coins at auction in 2003 when it achieved £138,000. In 2007 a Petition Crown sold for £207,100. It is said that only twenty copies were struck with the petition edge on it and this beautiful reproduction, cast in pewter is cast directly from one of those 20 coins. Obverse: Large laureate and draped bust of Charles II of fine style right, struck in high relief, SIMON in script below, toothed border both sides. Text around CAROLVS II DEL GRA. Reverse: Struck en medaille, crowned cruciform shields of England, Scotland, France and Ireland, twelve strings to Irish harp, pair of interlinked C's in each angle, date either side of crown above English shield. Order of the Garter at centre with St. George the Martyr on horseback, sword in right hand raised above head slaying the dragon, garter reading HONI SOIT QVI MAL Y PENSE ‘Shame to him who thinks ill of it’. Text between crowns 1663 MAG BRI FR ET HIB REX. Edge: Inscribed in two lines in raised letters. Line 1 THOMAS SIMON MOST HVMBLY PRAYS YOVR MAJESTY TO COMPARE THIS HIS TRYALL PIECE WITH THE DVTCH AND IF MORE. Line 2 TRVLY DRAWN & EMBOSS'D MORE GRACE; FVLLY ORDER'D AND MORE ACCURATELY ENGRAVEN TO RELIEVE HIM. Two crowned interlinked C’s between branches of palm and laurel at beginning of legend. History: Thomas Simon was appointed Chief Graver at the Tower under the Commonwealth regime in 1649. Upon the Restoration of the monarchy Simon was demoted and Thomas Rawlins was given the position of Chief Graver, Simon still remained in the Mint’s employ. In 1661 the King gave the order for Thomas Simon to go to France to obtain the services of Pierre Blondeau and his new screw press machines. Blondeau arrived in England with his machinery and tools, while Simon was issued with orders to make stamps for the new coins. Other engravers were brought in to assist in the process of making dies and John and Joseph Roettier, duly arrived in London on the invitation of the King and so the scene was set for the "competition" to determine who should make the new dies to be used on the new technology. The “competition” commenced and eventually decided in favour of John Roettier. Dissatisfied with the judgment, Simon created his Petition Crown, which bears Simon's petition in two lines around the edge, to the King to re-employ him as chief engraver at the Mint. The appeal was unsuccessful, yet there was other work available for Simon to do. He continued engraving the smaller silver coin dies and produced a new Great Seal of England. Thomas Simon died in 1665 a victim of the Great Plague.